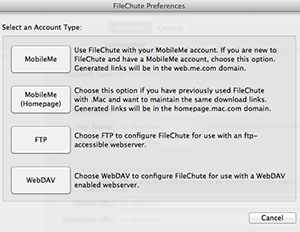 Add a new account in FileChute and choose FTP or WebDav from the drop down menu. 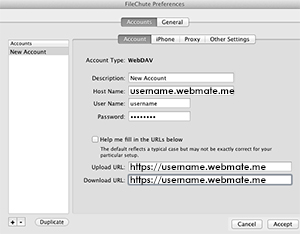 Enter your WebMate details in to the account settings and click Accept. A window will open showing the contents of your WebMate disk. 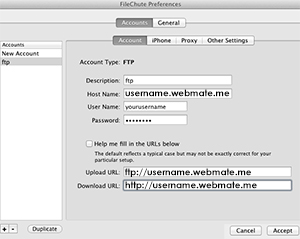 Open FileChute & select the connection type FTP or WebDav. FTP settings for FTP and WebDav are contained below. To get to a specific folder e.g. public, add “/public” to the end of the upload & download URL.